A painter, sculptor, and conceptual artist, Duchamp was, with Picasso and Matisse, one the defining figures in the revolution that redefined the plastic arts in the early Twentieth Century– in Duchamp’s case, as an early Cubist (the star of the famous 1913 New York Armory Show), as the originator of ready-mades, and as a father of Dada. In the 1930s, Duchamp turned from the production of art to his other great passion, chess. He became a competitive player; then, as he reached the limits of his ability, a chess writer. 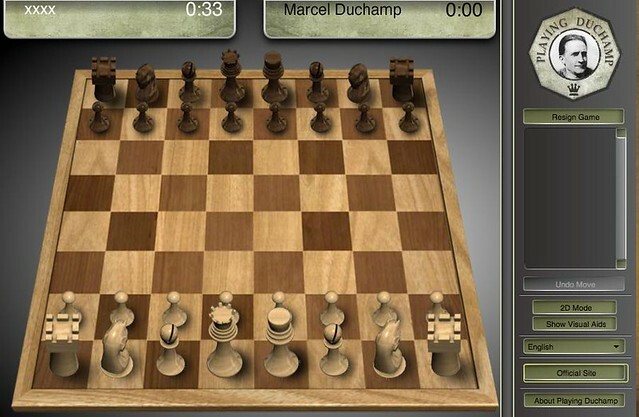 Duchamp’s Samuel Beckett, an friend of Duchamp, used Duchamp’s thinking about chess strategy as the narrative device for the 1957 play of the same name, Endgame. 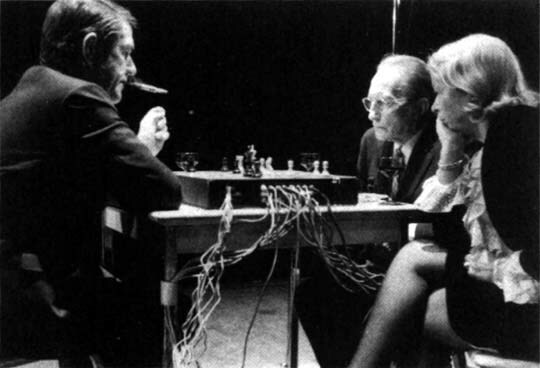 In 1968, Duchamp played an on-stage chess match with avant-garde composer, friend, and regular chess opponent John Cage, at a concert entitled Reunion, in which the music was produced by a series of photoelectric cells underneath the chessboard, triggered when pieces were moved in game play. So go ahead, play Duchamp. As we contemplate Duchamp’s urinal, we might note that it was on this date in 1863 that Thomas Crapper patented his version of the one-piece pedestal flushing toilet that still bears his name in many parts of the English-speaking world. The flushing toilet was invented by John Harrington in 1596; Joseph Bramah patented the first practical water closet in England in 1778; then in 1852, George Jennings received a patent for the flush-out toilet. While Crapper’s improvements merited a patent, his real contribution was promotional: In a time when bathroom fixtures were barely mentionable, Crapper, who was trained as a plumber, set himself up as a “sanitary engineer”; he heavily promoted “sanitary” plumbing and pioneered the concept of the bathroom fittings showroom. His efforts were hugely successful; he scored a series of Royal Warrants (providing lavatories for Prince, then King Edward, and for George V) and enjoyed great commercial success.